As Ward 2 councillor, Bob Bratina voted against the Airport Employment Growth District and commented on how the Ancaster Business Park has banquet halls and bowling alleys. Then, as a candidate for mayor, he turned around yesterday and said that we should consider scrapping the planned east-west LRT and do a north-south line instead to the airport to serve the AEGD. I love Bratina and his passion for Hamilton, but is this the sort of disconnected thinking we can expect if he becomes Mayor? If we're going to do LRT, do it right. Start with the biggest bang for the buck. I have no problem with a second line to the airport down the road, but not a first line. Mayoral candidate Larry Di Ianni commented in the Ward 2 debate that we should scrap King Street and put the LRT on Barton. Again, I'm all for future lines serving all areas of the city, but we will never see future lines if we don't first develop an initial line that is spectacular and sees great investment in the very heart of our city. Downtown and the entire King/Main corridor is the pulse of Hamilton and runs right through the most densely populated neighbourhoods and job nodes. It connects regional shopping centres and shopping districts with our university, McMaster Innovation Park, cultural venues and the downtown core. As Portland, OR keeps trying to teach us, fix the central heart first and everything will start to revive from there. As much as I love the idea, I don't think a 2-way king street + streetside parking has room for LRT. I would much rather see it on the throughway corridors (Cannon-Queen-King westbound, Main eastbound), but I understand that would make its already-prohibitive cost even higher. edit: The googles inform me of discussion that streetside parking would be removed from King street for the King St. LRT. This seems like a bad move. There are countless arguments for and against every conceivable east-west routing (my preference is two-way LRT on a two-way Main Street, with King, York and Cannon all converted to two-way as well). However, the difference between LRT on this major east-west street and LRT on that major east-west street is pretty small, given the close proximity of the streets and the breadth of the Transportation-Oriented Development (TOD) corridor. The important thing to remember is that staff are already a couple of years into the planning, development and design process, and the proposed routing already has the benefit of extensive research by experienced, professional third-party transportation planners. If we throw that away and decide to put it on James or Barton instead, we basically start from scratch with Metrolinx and scuttle any possibility of getting a timely provincial funding commitment. If that happens, LRT will be DOA for the foreseeable future. At this point, we need to draw a distinction between the perfect system we'd like (but all have different ideas about) and the good enough system we have a real shot at attaining. Once the tracks are in the ground, the rolling stock is in place and the TOD corridor has been zoned properly, the payback in assessment growth and city building will be so tremendous that it will generate the political momentum we need to build a second and a third line. I don't think even Bob believes that, he's just trying to differentiate himself from Fred. You're suggesting transit from a mall to a mall? I think you're confusing two things - the need for transit, and the need for higher order transit. Like you said, the east / west corridor where the B-line LRT is planned is already the most well used. That is why it needs to be served by LRT - the ridership is there to justify the added capacity. A mall to mall route might be adequate for bus service, but the first LRT line needs to go where the ridership is high and the capacity is needed. I'm new to following the LRT project so here's a beginner's thoughts. -An East-West line will do more to encourage lower city revitalization than a North-South line. -By looking at a map and just driving Main Street makes way more sense then King. It's a shorter route and much wider. I asked this question at the open house and it was explained that King provides a better net benefit for revitalization and private investment due to the proximity of existing housing and businesses. I can concede this point, however the pragmatist in me can't stop looking at Main . -Personal feeling: Turbo is correct about E-W transit needs already being serviced. I also feel from a practical view-point that N-S makes sense from as a people mover but does little to nothing in terms of revitalization opportunities for the core. -I agree if we start changing priority to N-S we could run into funding issues. -I'm hoping the new council will repeal the Aerotropolis project. I'm betting if AEGD goes ahead the LRT project could be hijacked by council and diverted N-S. I'm researching and really still forming my opinion on the whole project so I am very fluid on any positions on the subject. I do agree this could spur core revitalization. I have read some good opinions here on why rail is so much better and worth 3 times the cost of a dedicated bus line, but once again the pragmatist in me is having a hard time with the extra cost. @turbo - keep in mind this is not planning for 2010. This is LONG term planning, that also includes transformational urban investment/intensification objectives along the corridor. Exactly. After al, that is the main point of LRT. More to the point, EW is where the capacity is needed. It seems like every time I want to take the 5C from Downtown into Westdale, I have to pack into a sardine can, even on a weekend. The east-west lines get the most usage out of the whole HSR. I agree with Ryan and Jason. The LRT line will be best located where the highest current transit use already exists. Forget about LRT getting in the way of vehicle traffic. Any idea of putting LRT on a less developed street would be a mistake. Less commercially developed streets better serve vehicle traffic, and drivers don't need to worry about so many crossings, pedestrians, events, etc. Imagine King St. as a destination only, instead of a through street. The LRT will become the through traffic on King St. The result will be that King St. will no longer be the choice for getting across town. Right now people seem terrified, but they will adapt easily to choosing one of the many alternates. Not to mention all the time and money invested in the King St. LRT plan. We must not wonder what 'might' be better at this point. The choice was made using sound, proven studies. We need to put all of our support into the current plan to move it forward as fast as possible or we may set this opportunity back another generation. I still believe LRT is best served on Main. Put the LRT on King and you will take away from the streetscape on King in places where the road is not wide enough to take two LRT lanes without reducing the size of sidewalks and flowerbeds. Add to the fact the route is longer and will cost more. Main needs the investment that LRT dollars will provide far more than King does. Main will become more of a wasteland, not less if LRT goes on King. King will intensify with a greater number of people using the core, regardless of whether LRT is on there or not. The same cannot be said of Main. LRT is needed east and west at this time and needs to be more ambitious than it currently is. It needs to head further into Dundas and Stoney Creek. Let's make Ward 3 the place to be! If you convert Main Street to two-way traffic, it will be just fine. A car-free half-kilometer of LRT/cycling lanes/pedestrian – from Mary to Wellington, opening to traffic at the Crowne – should be no big deal. Cannon and Hunter will remain as brisk westbound corridors. @omro: all Main needs is to made 2-way. @Robbie K: exactly what I was going to write. Yonge St. was the first to get a subway, but being underground, vehicle traffic can flow. But being a busy commercial street, there are tons of stoplights and pedestrians, even the Dundas ScRaMbLe! I believe Yonge was the first to get horse-drawn trolleys way before, too. People that use the street are generally happy with this separation of uses. Drivers take the other N-S routes, even though Yonge is actually faster sometimes because of the lack of vehicles, don't tell anyone. @turbo: wont' the East-West buses be replaced by LRT, thus not creating a problem? No the east west buses will not be replaced by LRT only the B line ( 10 ) will be replaced. The local service will still be needed because the B-line/LRT stations are so far apart. Currently there are 2 major routes running on King/Main. The local ( 1, 1A )is not going to disappear. turbo said, "I just don't think there is a need for east west lower city. Its not growing nor will it grow The corridor is already well serviced"
But I think the whole idea IS to grow that corridor through intensification and renewal. We all know that is needed in the core area of that corridor. Bringing people to live in that area is vital to this city. Turbo: The local service will not continue. Consider the Bloor subway line in Toronto for comparison, there is no local bus service alongside the subway line, the subway is the only transit service along Bloor/Danforth. In Hamilton's case, we are fortunate that there are other east/west arterial level roads in close proximity to King/Main where local service could run instead. However given the option of slow local buses vs faster light rail trains, the bulk of the passenger capacity will be served by LRT. To your concerns about road width on Main between the Delta and the traffic circle, on-street parking will have to be eliminated however by changing / relaxing parking restrictions on side streets, parking capacity in this area will not be as decimated as it might initially seem. For a comparison, the bike lanes added to Dundurn eliminated on-street parking from the east side of the street, but by changing parking restrictions on the side streets, the net loss of parking spaces was only a handful (under a dozen if memory serves). With four lanes to work with, there is sufficient width to accommodate two way LRT and two way traffic. The world will make more sense to you, Capitalist, when you start seeing a world full of people instead of cardboard stereotypes. I'm not certain, but I think that all buses currently using Main, east of the Delta will be removed. LRT will serve Main with stops that are never more than a 3-5 minute walk from someone's house/business. The Delaware buses will likely use their current King St routing east of the Delaware and the Cannon will continue to use it's routing just north of Main. As a transit rider, I personally hope this is the end result and can't wait for it. I'm tired of the current King alignment with stops that are a 60 second walk from each other. Even if someone lives right on Main St, exactly at the mid-point between LRT stations they will only have a few minute walk to the closest station. As for the west side of downtown, I'm assuming that the Delaware/Dundas 52/ University 51 etc.... will all begin to use Main Street instead of King, leaving King with the LRT line. I don't see why a "local" service need necessarily cross the Red Hill. Passengers looking to go that far would feed to the LRT, Barton service, or King service simply. That's what happens now anyways. Lets also keep in mind that an LRT line along King/Main/Queenston would also by extension redraw the entire HSR network in the lower city. Buses that currently service the demand on this corridor could be redistributed onto existing or new routes. Potential east/west streets that could accommodate a new "local" service in the Delta-to-Circle area include Dunsmure and Central. Barton, Cannon, and King St would remain in service in some capacity as "local" services. Barton is not viable as an alternate to a Main local. Its much too far away. Dunsmure is a 2 lane residential street with a stop sign on almost every cross street ( I ride this regularly and know it cannot house bus traffic). Central might work but only if it has 15 minute service and Cannon is increased to 15 minute service as well. I cannot imagine that will happen so its going to be 20 or 30 minute service with unbearable transfer times Seriously this is a major downgrade in service. Another thing that would have to happen is full service on Centennial from King to Barton so you could actually use those lines and hook up to the Eastgate terminal. If Dunsmure has a stop sign at every cross street, it makes for a pretty good local bus route don't you think? As for increasing headways on Cannon to 15 minutes, its perfectly reasonable to expect that it would increase since there would be more buses and operators available for distribution onto this route (those previously servicing Main). If a local route is absolutely necessary as you suggest, then ridership on Cannon would increase and dictate at least a 15 minute headway. It would be evident pretty quickly after the LRT enters operation whether increased service along Cannon is required. Also, as an aside, I'm quite enjoying this debate we have going, you don't have to downvote me like its a reflex! The problem is that Cannon and Central can't cross the redhill and thus a lengthy transfer will be required. Everything was going so well my friend. Then you suggest I've never ridden the bus? Come on. Also, if you're trying to argue against the LRT by invoking how noisy, uncomfortable and dirty buses are, then I'm afraid we aren't going to get very far into this discussion legitimately. Surely if buses are so horrible, then we should be looking into alternatives! Lets discuss potential trips of passengers. Currently the only way to get to the other side of the Red Hill from a neighbourhood between the Delta and the Circle is by making your way to Main, King or Barton. This situation will not change with the adoption of LRT. The only change will be a slightly longer walk to an LRT station instead of a closer local stop. And this assumes that there will be no changes whatsoever to existing HSR routes. What about increased feeder routes, that run loops through local streets and take passengers to an LRT station? There are plenty of possibilities if we expand our perspective beyond the boundaries of what exists now. There are also plenty of examples where traffic is not snarled beyond repair when higher order transit is instituted well. turbo wrote, " The idea may be to grow in the area but until it does actually grow many times in the core there is no need for more than extra buses"
Not sure how much you've read about LRT's impact or if you've seen the TVO video here with the interview with Portland's mayor, but the idea is that the LRT will cause that growth, not that that growth will create a need for LRT. Good post overall, I can't disagree with much of what you said. I don't frankly understand why you would "never get on a streetcar that loads in the centre of the street". Is there a well documented safety concern with such a design that I'm unaware of? I want to get back to the main point of the discussion, that being the perceived need for local routes in coordination with the LRT. For those who prefer to utilize a local service such as what you've described for yourself, services that currently operate away from Main/Queenston can suffice to service that need, with the possible addition of local feeder routes. Again I refer to the example of the Bloor/Danforth subway system, which has no local service running parallel to it that is any closer than the distance from Cannon or King to Main/Queenston. The change will be significant to those who currently use Route 1, but with headways of between 5-7 minutes, an LRT system will be much more popular than any local route. Frequency, reliability and comfort are just as if not more important than slightly longer walking times. If its really all about promoting growth Kirk then Larry DiAnni's suggestion of Barton street makes infinitely more sense providing it runs from the Eastgate terminal to the downtown terminal. There is far more potential for growth along that corridor if its as simple as build it and they will come. Scares the crap out of me, it may or may not be backed up by stats but I'm not using it if its not a curbside entry. Dittmar, H., and G. Ohland, eds. The New Transit Town: Best Practices in Transit-Oriented Development. 2004. Island Press. Washington, D.C. p. 120. "Locate development close to transit. Effective TOD places residential and office space as close to transit as possible. The optimal walking distance between a transit station or stop and a place of employment is 500 to 1,000 feet. Residents are willing to walk slightly longer distances to get to transit, between a quarter- and a half-mile." There are tons of studies that suggest no more than 1500 feet is the ideal walking distance to a bus stop before people choose another mode of transportation. That's almost half a kilometre. You can have an LRT stop every 800m and everyone on the route will still be walking distance to a stop. The buses currently running the B-Line get redistributed to and feed/link into the LRT from other areas. Really it's not that difficult a concept, you just seem to be more interested in wet-blanketing the whole thing than figuring out how to make it work. When I first heard about the LRT, I was really excited about it and what it could bring to the city. I attended one of the information sessions at City Hall and now, the more I learn about it, the less enthused I am. I really worry that the LRT would cause traffic mayhem in the city. The only thing that prevents me from going to Toronto more often is it's horrible traffic. I can understand how an LRT is supposed to (and has in other cities) bring investment dollars into a city, but unless it's done right, it could be a real nightmare. Given Hamilton's road infrastructure, I'm not sure it's possible to include LRT because of the road space it will take up, and there fore the amount of car/bus lanes that would disappear. To all the people citing how well it works in Portland, have you looked at a Portland map? The city is packed with one way streets, tonnes of lanes of traffic, 2 major highways surrounding it in close proximity. There are tonnes of options and lanes for cars and buses. Even the roads with the LRT have 2 lanes in both directions and a turning lane. Unless we can do the same, as much as I would love to see an LRT in Hamilton, I don't think is practical given our road lay out. I forgot to add that Portland has FOUR times the population density of Hamilton. Again, I'd love to see LRT, but just because it works somewhere, doesn't mean it works everywhere. Unless we tear down hundreds of buildings and make roads wider, I don't see how it's realistic here. Not trying to be a smartass or anything, but I guess that's why they're doing a study. I'm eager to see the plan and what they'll say about traffic impact. Maybe it's time to revisit the perimeter road idea for this and other reasons. Between the 1 King, 5 Deleware and 11 B-Line and 51 University, there are up to 26 trips on the east-west route during an afternoon hour on a weekday. Between the 27 Upper James and the 20 A-Line there's about five. Between the 26 and 26 (Upper Wellington and Wentworth) there's up to 9. And yet, with 3-5 times the number of busses (not even getting into the Barton and Cannon etc), the east-west route is, at least in my experience, far more likely to be full to bursting. The population density is higher, so stops can be closer together. Turbo's right - the east-west route certainly has the most buses. And that's exactly why it needs an upgrade. Building LRT out into the middle of nowhere will serve only developers. I forgot to add that Portland has FOUR times the population density of Hamilton. Why do you think that is? Portland's downtown in the 1970s was like the downtowns of most North American cities: underinvested, with lots of abandoned buildings, wide, car-friendly streets and abundant surface parking. It was precisely by committing to urbanism - building LRT, taming their streets, establishing dense mixed-use building regulations, setting a firm urban boundary, removing highways, planting a million street trees, building a continuous bike lane network - that Portland achieved its densities. Also: please note that the average density of Hamilton is quite low, but the density of the lower city is much higher. The east-west corridor today has the density to justify LRT - and that density will only increase as the line and TOD planning corridor drive billions of dollars in new investment over the next several years. having actually lived in Portland I can verify that they don't have mega wide downtown streets with several lanes and cars sharing LRT streets. In fact, off the top of my head the only streets I can think of downtown where cars drive on the same streets as the LRT are streets that have been made 2 lanes TOTAL - one for LRT, one for cars. The north/south streets that are one-way have parking on both sides, stoplights at every block (50-100 foot distances) and are NEVER timed to be green. In fact, I'm convinced that they were timed to go red if you happened to hit 2 greens in a row. Sidewalks are insanely wide, bike lanes are everywhere and through the dense central core of the city the LRT stops every 2-3 blocks. Most people park in parking garages like our parkade. In fact, many public and cultural events that take place downtown encourage participants to use bike, transit or walk and leave the car at home. My only complaint with Hamilton's current plans are the spacing of stops in the central city. I think we need to add stops at King/Locke, King/Paradise and the Delta. The density and destinations in those areas make it very viable to add a few stops. One big difference between Portland and Hamilton - Portland rarely experiences snowfall. What would be the impact of snow removal on a route with one lane LRT and one lane road, as far as snow removal costs and storm recovery time goes? Has this been discussed as part of the planning? If so I would like to know what conclusions were reached. A point of clarification regarding density levels along the east-west LRT route. According to the city's own study on the matter, the east-west LRT route has density levels sufficient to support LRT (120-200 pph) only in the portion that runs between Queen and Wentworth Streets, and not the entire stretch of the route. And that is based on projected density for the year 2031.
which is exactly why it needs to go on the EW corridor. So we can re-populate and rebuild our city from the inside out. The future densities will far exceed their projections if we bring in LRT and do it right. @ realitycheck: Calgary has an extensive LRT system and last time I was there they were getting plenty of snow...in May! Many Northern European cities (those in Norway and Sweden come to mind) have LRT systems. Ryan, You said "It was precisely by committing to urbanism - building LRT, taming their streets, establishing dense mixed-use building regulations, setting a firm urban boundary, removing highways, planting a million street trees, building a continuous bike lane network - that Portland achieved its densities". You should really check your facts before making, what sound like good arguments, up. The population density of Portland in the 1980s was over THREE times that of Hamilton. you said "please note that the average density of Hamilton is quite low, but the density of the lower city is much higher". Do you really think people are that stupid? Of course that is true, but it is ALSO true of Portland. "The east-west corridor today has the density to justify LRT - and that density will only increase as the line and TOD planning corridor drive billions of dollars in new investment over the next several years". Who needs a study when Ryan can predict the future. Now I understand why you include the quote under your posts. @ Turbo: Please corect me if I am wrong but are you confusing an elevated train (like in NYC or Chicago) with what is in Calgary? Calgary's LRT is ground level. Part of Edmonton's LRT is elevated (over the Saskatchewan River valley), partly underground (south of the valley) and partly above ground (north of the valley). I did some quick checking, as I have never had the opportunity to visit Oregon. From what I can see from just a quick survey, the Calgary and Portland LRT systems seem very much the same. I have added some links to photos of each. 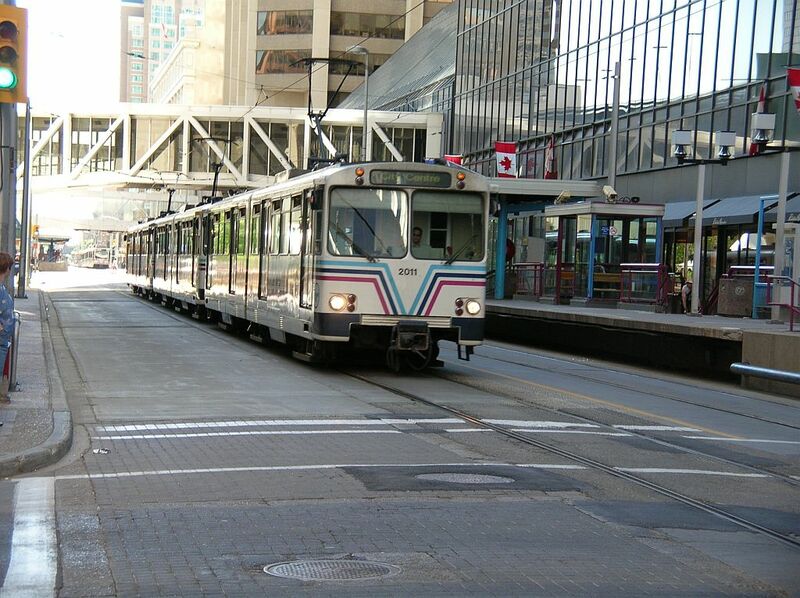 The first is a picture of the Calgary LRT. 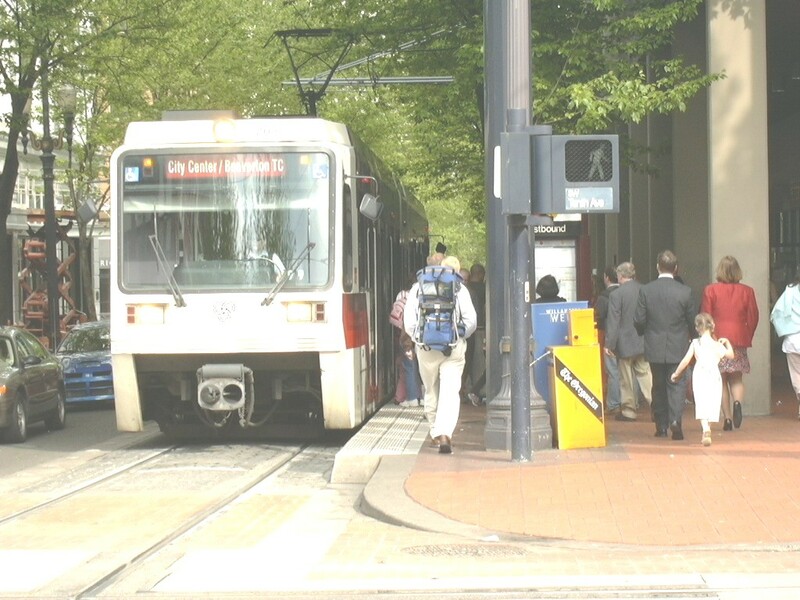 The second is the Portland LRT. They appear similar to me. Actually I must have been thinking of Edmonton. Calgary is predominately a raised rail bed which is also quite different than a road installation. Can everyone please stop feeding this obvious troll? Turbo doesn't want to debate, he just wants to disrupt. I wasn't aware of that one. @ChrisAllen my concern wasn't about LRT running in an area with snow, my concern was running an LRT along a road that only permits one lane of regular road traffic and the implications that has on snow removal, both from a cost and a storm recovery time period. If there is only one lane for exclusive LRT and one lane for exclusive road, where does the snow get pushed during initial clearing actions? In a tyical two lane road, one lane is used to collect snowbanks during preliminary cleanup during and for a period of 24 hours after a storm. Which service is disrupted during snow removal - LRT or road traffic? What additional costs are associated with snow removal under these circumstances? These are valid concerns that need to be considered and not simply dismissed off the cuff by saying other cities with LRT get snow. Do they have the same type of LRT route as what is being proposed in Hamilton? How do they handle snow removal? How has their snow removal practices impacted snow removal budgets in their city? @ realitycheck: I was not dismissing your concerns, they are valid. I was offering another model to look at. If I remember correctly all of the Scarborough LRT is elevated. Bob Bratina did vote against the airport lands yes, however it went through therefore he is saying since you are going to build thier you better have transportation to it. I didnt find that hard to figure out but then again I have an open mind and am not trying to make him look bad because I favour another candidate.